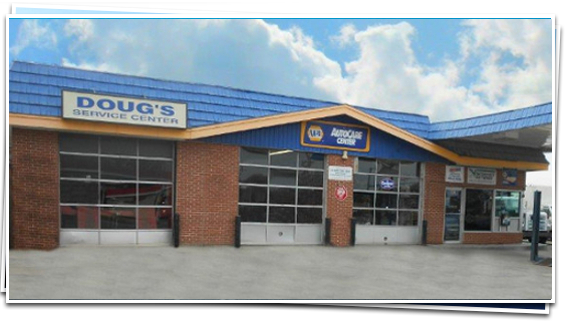 Doug’s Service Center has been serving the people of Topeka with high-quality auto repair since 1993. Our skilled auto technicians have all the factory-level tools and diagnostic equipment so your vehicle stays in tip-top condition. Doug’s Service Center has Toyota, GM, and Ford factory scan tools. Our auto repair technicians also use Autel and Snap-on diagnostic scan tools for Asian vehicles. And we recently purchased a system so that we can reprogram Ford’s computers. Doug recently graduated as an Accredited Master Automotive Manager (AMAM) from the Automotive Management Institute, its highest designation. We can fix anything. Our team takes care of cars that have gone to other shops and can’t be fixed. The other shops around Topeka say “go to Doug’s” because once the technicians at Doug’s get ahold of a problem, our stubbornness kicks in, and we won’t let the car leave until it is fixed. Our clients here at Doug’s Service Center love our honesty. We won’t throw parts at the car, hoping the parts will magically fix the car, unless we know for certain that the problem part is bad. We don’t try anything until we are sure it is going to work. We don’t want to waste your time with “maybes.” And we don’t sell you stuff that you don’t need. Whether your vehicle has an issue with wiring, brakes, or alignment, one of our technicians will be able to fix it. For instance, we have someone who works on the wiring because for some darn reason rats find the soybean casing on the wires delicious. The team at Doug’s Service Center is also very experienced at fixing brakes due to the snow, and wheel alignments due to the potholes. People around Topeka have those two issues a lot. As for comfort and convenience, we have shuttle service with a dedicated Chrysler Town and Country minivan. Our clean and dry waiting room has WiFi, but we would much prefer that you take advantage of our shuttle service and allow us to give you the VIP treatment you deserve. It’s just a small way for us to thank you for bringing in your car! Here at Doug’s Service Center in Topeka, we have a service advisor and two technicians. One of our technicians is Doug’s nephew. He has been with us for over ten years and one day he may take over--he’s that good. The other Technician has been with Doug for over 4 years. The technicians are ASE-Certified, which means that you can depend on us to be able to accurately diagnose and repair your vehicles. Our service advisor has been with us for over two years and won a scholarship called the RLO Memorial Scholarship. She is awesome, and we are so proud to have her. Doug is very much in sync with the local farming community and understands their issues. Doug gives back to the community by being active in 4-H and was the 4-H Club Leader for four years. He was President of the Livestock Committee for about 7 years, and he was also on the Fair Board for a few years as well. He has 25 cows so tame that the vet doesn’t like them. He loves working with cattle. After work, he gets on his tractor and works with his cows and bales hay. Doug and the entire team love a technical challenge and have a strong sense of pride at being able to fix everything and anything. If you’re looking for an outstanding auto repair shop in the Topeka area with integrity, honesty, and great customer service, then you’ll love Doug’s Service Center. You deserve the best service possible, and we definitely aim to please. Schedule an appointment today or stop by. We’re at 601 Southwest Fairlawn Road, Topeka, KS 66606.